Back again for one more year, this time, to claim the San Francisco marathon bling. Last year, I ran the second half (I admit, the 8:30AM start time got to me), and missed out on running across Golden Gate Bridge. Since I basically took the summer off from any real training (i.e. speedwork, tempo runs, hill sprints..all the good stuff), I didn’t expect much from this race. Like I said, I pretty much signed up for this race for the marathon medal. I was pretty disappointed last year by the small key chain medal for the half. What can I say? I’m a bling whore. I didn’t even need this race to complete my California Dreaming Series, as I did that in Long Beach last year, but my little medal box was missing the SF marathon medal. It was exciting to fly up with so many friends who were also running the half or full marathon. I love little weekend trips like these and traveling for a race is always more fun with friends, especially when 40% of the plane was filled with runners. The start time was at 5:40AM for me (Wave 3) and surprisingly not too cold being at Embarcadero. 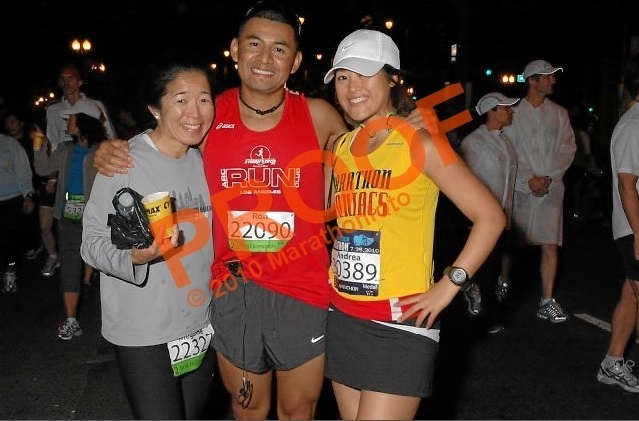 This was my first time wearing my Marathon Maniac shirt and actually met a couple people who were also Maniacs before the race. The first 5 miles, I was not feeling it at all. My calves were hurting, legs were heavy, the excuses continue. We hit a hill before winding up the Golden Gate and contemplated dropping to the half marathon. Once we hit Golden Gate, we spent the next 5 miles on the bridge. Running on the bridge was awesome. I got to see friends who were coming back from the other side and lots of Maniac support on the bridge. This part definitely lifted my spirits and I was ready to forge on. My only complaint was that the bridge was a bit crowded. I thought they would block off the entire bridge, but they only blocked off half and made running a bit uncomfortable with so many people. By the time we got off the Bridge, we were already at Mile 10. Apparently I missed all the mile markers on the bridge, so I was pleasantly surprised that we were almost halfway done. Did I mention the weather was awesome? The sun never came out once during the race. At some points on the Bridge, the mist and fog almost made for a light drizzle. 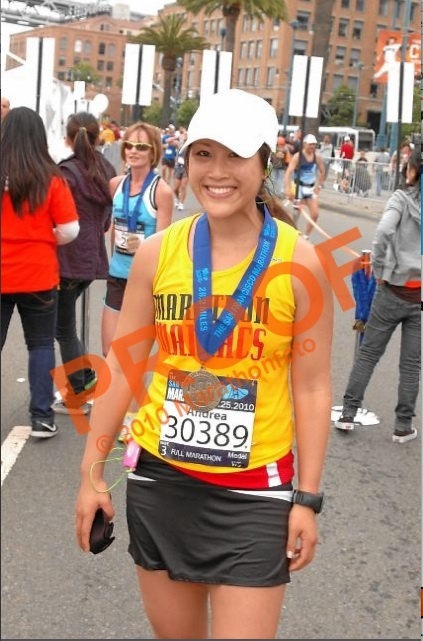 Mile 10-13 we winded through the hilly streets of San Francisco. The hills were definitely taking a toll on my legs. At Mile 13, the full marathoners split off from the half and instantly, the crowd got smaller. I really wanted to pass the point where they started to let the 2nd half marathoners in because I remember bombarding the full marathoners last year. Mile 13-16 I suddenly got a burst of energy running around Golden Gate Park. No idea where it came from (possibly the techno music that came on? ), but I was passing people left and right and sprinting the uphills. I wanted to ride out this high for as long as I could and kept telling myself to go one more mile. I knew it wouldn’t last until the end of the race, but this feeling reminded me of how I felt during the Disney Marathon. Except, during Disney, I rode the high from Mile 13-26. It was awesome. Anyways, the high wore off after Mile 16 and everyone that I did pass ended up passing me again. Right before Mile 18, we passed by where the 1st half marathoners were finishing and was surprised to see three of my friends waiting for me. Only 8 more miles to go, I knew I had it in me to finish, but I couldn’t guarantee a good time. This part of the course was familiar territory for me, as I did it last year. I can’t really remember what happened between mile 18-24, it must have been uneventful. More weaving through San Francisco streets. More hills. I told myself that if I needed to, I could take a walking break, but I never did. Unlike L.A., where if I felt that if I didn’t take a walking break, my knees might have popped out. During the last part of the course, I started to get really dehydrated because the stations were 2 miles apart. The hills were doing a great job killing my legs even more, so I just took it easy and rode the downhill. Before I knew it, we were turning the corner onto Embarcadero. I thought my pace would pick up the last 2-3 miles, but I couldn’t do it. I was tired and just wanted to be done. By the way, my Garmin clocked in over 26.50 miles! My other friends had the same problem, anyone else experience this? Official finish time: 3:57:37. Post-race, I hoarded so much free goodies it was ridiculous. I had granola bars, peaches and Jamba Juice smoothies pouring out of my sweaty arms. After the race, I headed straight back to the hotel. I actually felt a little nauseous and sooo exhausted. I couldn’t eat anything until 3 hours later when we were at the airport and even then, I wasn’t even hungry. Anyways, I had a couple days to digest the whole race experience and where I want my training plan to go. I’m not disappointed by the race, actually I’m pretty happy that I set out to do this race for fun, enjoy the course and come home with no injuries. It’s been bothering me lately how much speed I have lost. I was at my peak last November-January and set 2 PR, my marathon at Disney and half marathon at Surf City. At that time, I was running 40+ miles a week, speed workouts, hill sprints and tempo runs. I wanted to BQ so badly and I did with some work. It wasn’t easy, or fun sometimes, but it felt good to know I could hold a pretty good pace for a long time. Right now, running a 8 minute miles for anything over 10 miles is uncomfortable for me. If I want to break 3:30 at St. George in October, I better shape up and start training again. I think taking the summer off has helped me regain the boost I need to really focus on my fall races. St. George is a little over 2 months away, so it doesn’t give me a lot of time to rest in between. I am super stoked about this race because it is one of the top 10 fastest races in the U.S. Also, the course descends nearly 2600 feet through scenic southwest Utah which isn’t bad either. My strategies for the fall races? Track workouts, hill sprints (I found a nice 200 meter hill at West LA College that I used to run up and down a lot), a couple long distance runs and the stair master. The stair master is something new to me, but I met an elite runner this past weekend who was also doing St. George and had done it the year before. He works out on the stair master for x-training and even just 30 minutes on the machine can give you a really great workout and build the endurance for hills. October is going to be super busy because right after St. George, I have the Nike Women’s Half and L.A. Rock N Roll Half back to back. Then it’s time to start gearing up for my first ultra marathon, Santa Monica Mountains 50K, in preparation for my first 50 mile race in Avalon, Catalina in January! So excited for all these races, however I’m having a hard time piecing together a training plan to accommodate all these races. Will update this page more with training progress and other musings. It was good seeing you and all of the other maniacs in SF! Good luck with your training for St. George!